This high quality brush is the ideal applicator for a wide variety of pressed or loose powder bronzers. For use with RADIESSENCE Body Bronzers. The ultimate exfoliating washcloth for face and body. 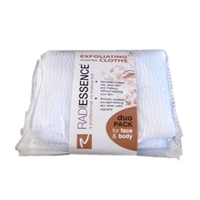 The RADIESSENCE Quick Tan Microfibre Application Towel is made of a special grade microfiber for applying the RADIESSENCE Instant Tanning Mousse to achieve a quick, easy, no mess, even tan. Great for hard to reach places, the RADIESSENCE Tanning Applicator helps you keep your hands stain free and create a professional no-makeup look.